This PDF 1.5 document has been generated by Microsoft® Word 2016, and has been sent on pdf-archive.com on 12/06/2016 at 05:02, from IP address 74.56.x.x. The current document download page has been viewed 424 times. File size: 241 KB (5 pages). association, henceforth referred to as the association. 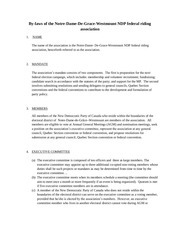 submission at any general council, Quebec Section convention or federal convention. if five executive committee members are in attendance. 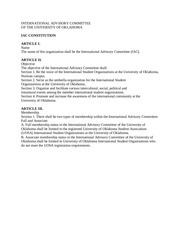 Section Convention or federal convention. cannot sit on the executive as a voting member. the meeting as a non-voting member. Officers of the executive committee are elected by members of the association at the AGM. committee can choose someone to fill the vacant position until the next AGM. (b) Secretary: Issues notices of meetings, draws up agendas, keeps minutes and records of resolutions. (e) VP Events: Handles the logistical organization of meetings, policy discussions and social events. Party training events, and organize Days of Action and other such events. 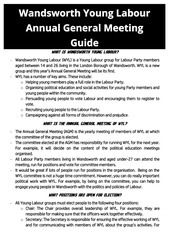 important to youth, and recruiting and training our younger members. projects which the Executive Committee from time to time. until the election of the new executive at the following AGM one year later. that does not hold an AGM will no longer be recognized by the Quebec Section. invitation or receive an invitation by telephone. 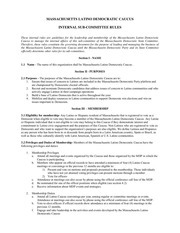 membership at the AGM and be eligible to vote. 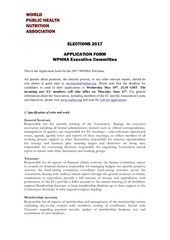 executive committee or if it is open to members at large. candidate must receive a simple majority of the votes. members at the beginning of the nomination meeting. 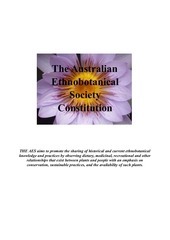 The statutes can only be modified by a 2/3 majority vote of the members during an AGM. For further information, consult the by-laws of the Quebec Section. *Only the French version of these by-laws is officially recognized by the Quebec Section. This file has been shared by a user of PDF Archive. Document ID: 00385061.